Great Customer Service…We are here for your business 24/7. Don’t worry about technical details like how to set up website hosting and management, domains, SSL certificates, Imap emails accounts and more. Stern PR Marketing partners with one of the nation’s best website hosting/domain companies on the planet – Godaddy. With Stern PR Marketing web hosting, you’ll receive 24/7 support, from Godaddy AND Consultant Susan Stern, should any problem arise. Godaddy is an ICANN-accredited domain registrar and provides reliable web hosting, Imap email accounts, domains, SSL certificates (HTTPs for security), superior small business products like outright.com. Under the monthly Marketing/Advertising/SEO plan, Stern PR will manage all your web hosting needs, offer additional support should problems occur Monday-Sunday, remind you when hosting/domains are set to expire. Handle all the details for you. 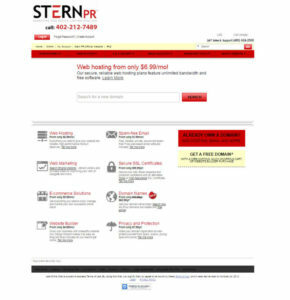 Contact Stern PR Marketing firm in Omaha, for more info about web hosting services.